6 lenses per box @ $35.78 per box. Minimum order 2 boxes. 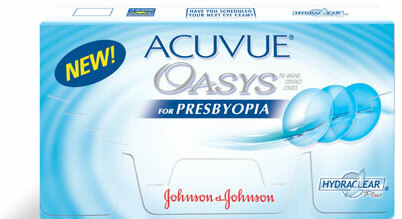 The latest multifocal contact lens from the Acuvue stable, the Acuvue Oasys For Presbyopia combines Johnson & Johnson's Zonal Aspheric Optical Design and Hydraclear technologies to provide balanced close, intermediate and distance vision along with supreme moisture-retention: crisp vision in comfort. This lens also offers class-leading UV-blocking.